Yes I am!! 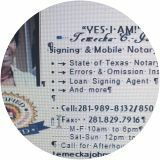 Mobile notary and signing agent. I’m bonded and insured also clean back grounds check done by NNA.